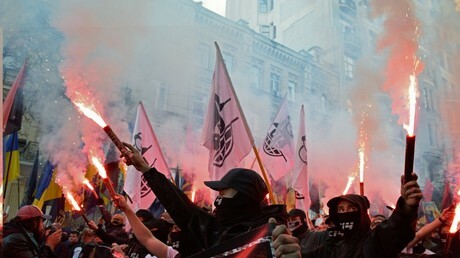 Police said that 15,000 took part in a sanctioned nationalist march through the Ukrainian capital, to mark the anniversary of the Nazi collaborator guerilla group that fought against the Red Army during World War II. The heavily-policed procession comprised different strands of nationalists all marching under their own banners, from parties represented in parliament, to paramilitary and far-right groups, many of whose members hid their faces. Most chanted “Glory to Ukraine!” and slogans in praise of Stepan Bandera, the man who founded the Ukrainian Insurgent Army 76 years ago, a date that has been made an official state holiday since 2015. Many shouted “Death to Muscovites!” and demanded to “Return Ukraine to Ukrainians!” – a reference to Crimea joining Russia in 2014, and the ongoing stand-off in the east of the country. About 100 people were detained, but police said that there was no major disturbance of public order, despite flares and smoke bombs being repeatedly set off by demonstrators. Earlier on Sunday, about 100 far-right activists brought a ladder to a statue of Nikolay Vatutin, a Soviet World War II general, in central Kiev, in a bid to disfigure the monument. Police confiscated the ladder, and cordoned off the statue, which was then pelted with eggs. The statue of the general, who was killed by Ukrainian insurgents in 1944, has been under particular attention since 2015, when a “decommunization” law was passed, requiring Soviet symbols to be removed, although war memorials are exempt from the legislation.